Guests may hop on and off the trolleys and spend as much time at each attraction as they please over a 24-hour period. 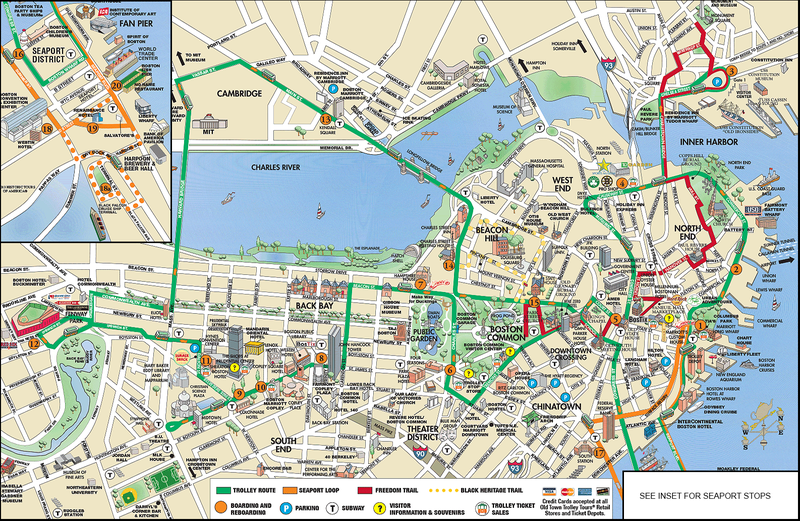 Sights on the tour include Beacon Hill, Newbury Street, Faneuil Hall Marketplace, Bunker Hill Monument, New England Aquarium, USS Constitution, M.I.T., Old State House, and so much more. With 24 stops at more than 100 points of interest, this highly customizable tour is great for exploring the city. Your ticket is also good for free admission to Old State House Museum, Boston's Dreamland Wax Museum and half price ticket for Old North Church ( Show your Trolley ticket at Old North Church for discount). Newbury Street One of the most popular shopping destinations in the city, Newbury Street is located in Boston's Back Bay neighborhood. There are many high-end stores located up and down the street, such as Burberry, Ralph Lauren, Chanel, and many more. Old State House Not to be confused with the large, gold-domed building on Beacon Hill, Boston's Old State House was the site of the Boston Massacre in 1770 and is a major stop along the Freedom Trail. Today, it houses a small museum. Departure Location: Faneuil Hall: 200 Atlantic Ave, Boston, MA 02110; Patrons with Tickets can board at any Old Town Trolley boarding location. Old Town Trolley Tour: April 1- Oct 31: 9:00 am-5:00 pm; Nov-Mar: 9:00 am-4:00 pm. Closed on April 15 (Boston Marathon), Thanksgiving and Christmas Day. Tours depart from boarding locations approx. every 15-20 minutes (April-Oct) and approx every 25-30 minutes (Nov through March). Ticket includes unlimited re-boarding ALL DAY LONG. Please note that the free portions of the ticket have no cash value and is not refundable. Ticket is valid for the Use Date shown or any future date up to 1 year from purchase. Without an e-Ticket voucher or mobile ticket you must go to the ticket booth location with invoice order number. Trolley Booth located at 200 Atlantic Avenue, Boston, MA 02110 (directly on the end of the Marriott Long Wharf Hotel). Veteran's Ride FREE on Nov 10-11. If a Calendar Date is unavailable, the tour is sold out for the day.